Contact us with your dates and particulars for most recent specials. CRYSTAL CRUISES Aug 8, 2017, all inclusive Alaska. Book by 6/30/16 for $250 per couple shipward credit. CELEBRITY CRUISES May 21, 2017, Alaska/Canadian Rockies 10-night cruise from $3469 per person including special of your choice. There is so much to explore and see in Alaska, America's last frontier. From cruising its majestic shoreline and waterways to touring its cities, towns, and vast wilderness; all of which offer unique American experiences. As Alaska Travel Specialists, Travel Harmony can assist you in planning and booking your entire Alaska adventure. We can also help you with just those segments for which you wish assistance, such as day tours, transportation between destinations, lodging, car rentals, local guides, and other desired accommodations. While we arrange travel to many locations throughout Alaska, our most frequent destination requests are listed below. These popular areas reflect many, but far from all, of the numerous travel alternatives available in this majestic wilderness state. 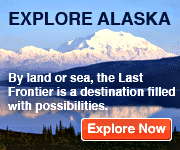 Thinking of visiting Alaska but not via cruise ship? If so, ask us about our customized, independent, travel arrangements. Planning and arranging travel to Alaska is a major specialty of Travel Harmony. We can offer you a travel program to readily fit your budget and interests. Travel Specialists for Australia, New Zealand, Tahiti, Hawaii, Alaska,South America, Honeymoons, Europe, Cruises and more.